Canada’s cannabis companies had another rough day of trading on Monday. 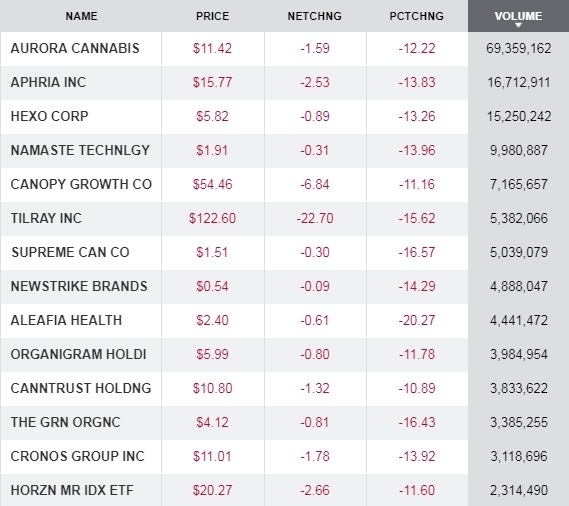 Investors continued to broadly move out of the cannabis sector with some big names such as Canopy Growth, Aurora Cannabis and Tilray all posting double-digit declines. BNN Bloomberg’s David George-Cosh notes that while cannabis stocks have fallen consistently since pot became legal in Canada on Oct. 17, it may be simply a case of “sell the news, buy the rumour” for now. As strong demand for legal pot has led to some product shortages, further delays may be on the horizon after Canada Post started a number of rotating strikes across the country. The union representing Canada’s postal workers said it will begin work stoppages in Halifax, Victoria, Edmonton and Windsor, Ont. The delays could hamper deliveries of legal pot in British Columbia and Ontario, where the bulk of the orders made in those provinces are online and require use of the postal system for delivery. Toronto-based credit ratings agency DBRS released a report on the cannabis industry, highlighting how the sector has essentially legitimized a whole consumer products market overnight. The analysis finds that Canada’s wholesale market for cannabis will be worth between $4 billion to $6 billion annually based on an estimate of 900 tonnes a year. That would equate to a wholesale price of approximately $5 per gram, DBRS said. More importantly, given the nascent status of the industry, DBRS believes cannabis companies’ credit ratings can be low, non-investment-grade, or in other words — in the B range. Not surprisingly, there was a lot of pent-up demand for legal weed in Canada. Ontario announced that it had processed about 100,000 orders on the first day of legalized marijuana in the country, while Quebec said more than 42,000 orders were made in the province. In total, about 172,000 orders were made in the five provinces that have so far published sales figures from Oct. 17. Going forward, provincial regulators will be issuing statistics on a quarterly basis to give a better idea on how sales are faring. – Marc Lustig, CEO of Origin House (formerly CannaRoyalty), on his company’s U.S. expansion plans.